April 2015 - A Life From Scratch. It’s all about the… guys. So we all know I’m used to living in boy world. I’ve got M, I’ve got L, I’ve got B. There are a lot of wrestling matches, baseball bats, mud, sticks, and bugs in my world. But now I also am living in construction world. And construction world is very parallel to boy world. Lots of rocks, dirt, mud, noise, and of course the construction crew. Yep, most days its just me and the guys in the ol’ Cape Cod. All eight of them. It seems oh so fitting to indulge in a super manly man recipe considering what is going down around here. Italian beef in the crock pot could not sound (or smell) better. Super easy to throw together, this is absolute perfect recipe to satisfy all men currently in my life. M had two. B inhaled it. And there were enough leftovers to feed the construction crew the next day because, well, you should be nice to the guys building your dream home. 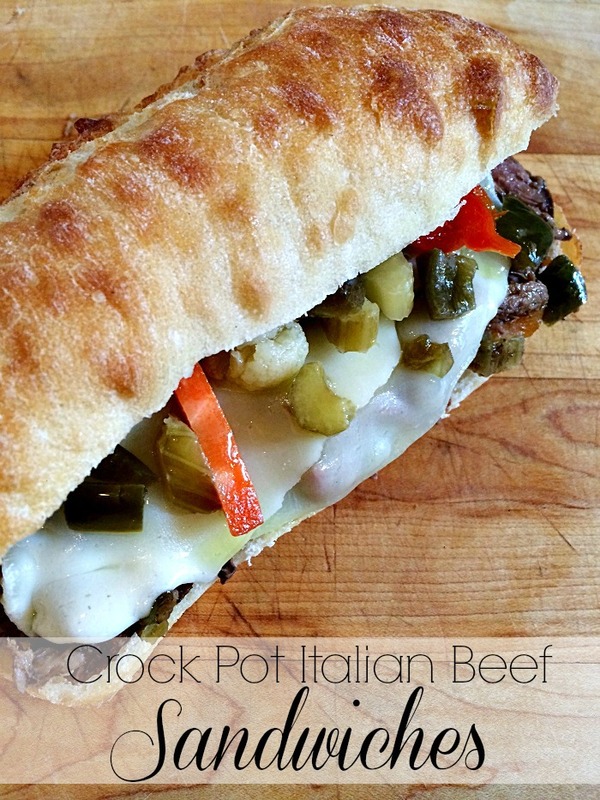 And these Italian beef sandwiches are nice. Very very nice. Place chuck roast into the bottom of a 5.5 - 6 quart crock pot then sprinkle with salad dressing mix. Add pepperoncini peppers plus a splash of juice, Giardiniera, and beef broth then lift up chuck roast pieces to get broth underneath. Place a lid on top then cook on low for 7 hours, or until meat shreds easily with a fork. Shred then place meat back into crock pot and cook on low for 1 more hour. Oh Spring, you can be so fickle. 40 and rainy one day, only to be followed by 70 and sunshine. While this isn’t exactly my favorite season, there is a ton I am crushing on right now. Without further ado, here are my picks for Spring. 1. Who doesn’t want a chance to start over? I’ll admit it – the name and the blush color drew me in but rightfully so. This cream works wonders while you sleep the night away. Zzzzz. 2. I’m just starting to get into the whole essential oil craze and I am cautiously optimistic about some. My boys suffer from growing pains (it’s hard to be tall! ), and this oil has been helping them at night. There is a stronger one for adult muscle pains called Deep Blue but the massage blend is gentle enough for little ones. 3. So in love with the rebel pendant. Like wearing it every day in love. 4. J Crew’s new line of New Balance shoes could not be sweeter. My neon pair are sold out, but these are pretty darn cute. 5. I realized the last time we were in Florida that I have been carrying the same LL Bean pool bag since L was 18 months old. It’s still in somewhat acceptable shape, but I thought an upgrade was due for this summer. 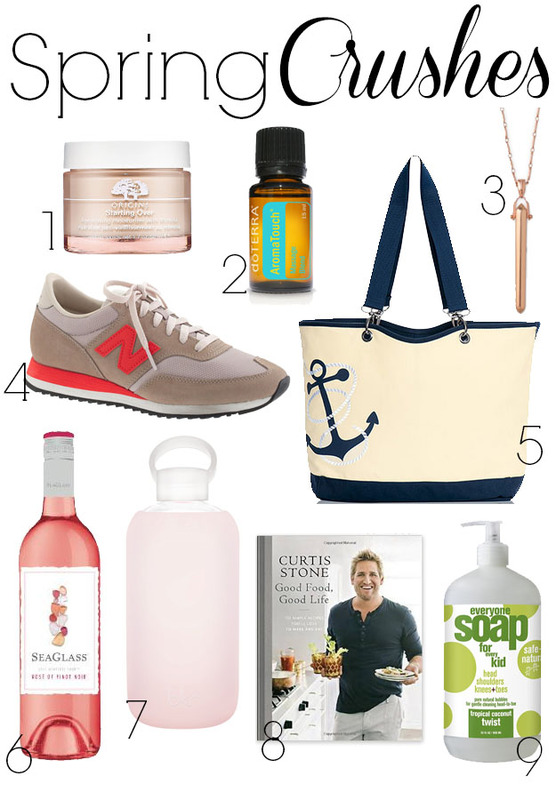 Loving this 31 bag, bonus that you can swap out the straps to these adorable nautical rope ones. Obsessed. 6. Could this wine be any prettier? That answer would be no. Huge bonus that it’s absolutely delicious and comes at a sweet price of $12.99 (found at Whole Foods). Perfect for a girls night in. Or a random Tuesday. 7. I feel so far behind on this bkr water bottle trend. It’s glass, which I just love. Call me crazy but the water really does taste better. And yes, I’ve dropped it, and it’s still in one piece. 8. Oh Curtis, I couldn’t let a spring crush post go by without mentioning your new book. Fingers crossed it’s in my hands on Mother’s Day. 9. Another brand that I feel has been missing from my life. I lather the kiddos up in this and then proceed to smell them all day long. So. good. They have killer scents for adults too. So what do you think? Anything new you’ve found yourself loving this spring? Share your favorites in a comment below! Even though the weather suggests otherwise, baseball season has officially started in our town…play ball! Aaaaand Go A’s! Alright, time to focus on the kitchen line up for the week. Who’s doing their weekly menu plan with me? On Sunday we are off to my mother-in-law’s for dinner, which should be fun as the boys gets to see their little cousin! I’m bringing along these perfect roast potatoes. Then on Monday, knock on wood, I think we can get the grill going on since it’s no longer 30 degrees and snowing, like last week. Oh my goodness, how good does this grilled chicken look? It’s topped with veggies and cheese and um, bacon, on the grill. Yes, please. I’ve had this recipe on my agenda for weeks, and for some reason I never get around to making it. That’s changing Tuesday night. For Wednesday let’s get a lighter chili going on the stove. Tons of veggies, tons of fresh herbs, this one keeps things super healthy. On Thursday, let’s keep it simple. 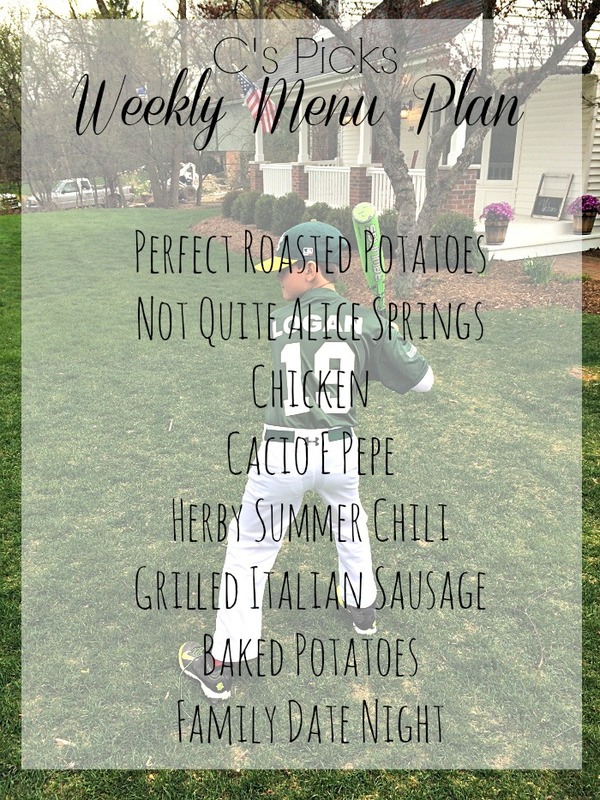 My boys love love love grilled Italian sausage, so we’ll be throwing some on the grill while baked potatoes get nice and fluffy in the oven. And that brings us to Friday. Hoping for a nice evening to spend out with the family! So, what’s cooking in your kitchen this coming week? I hope I’ve inspired you to get prepared! Ok Chicago. What the heck is going on? You can not go from 60’s – 70’s – even 80’s and turn on us like this. 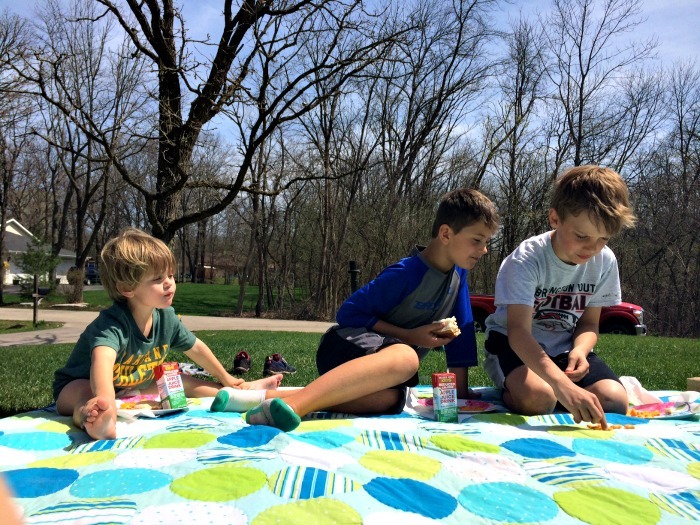 Last week we were running barefoot in shorts and tees and eating on picnic blankets and barbequing outside with friends late into the evenings. This week? Well, it’s back to winter coats. Back to boots. Back to flannel pajamas. Back to gloves? I know you keep thinking it’s 50 and sunny, but in reality with the wind that basically translates to 20 degrees. And there is no sun. Not cool man, not cool. What to do, what to do. Well, not much aside from hibernating, which is pretty much what I’ve done this week. I finally threw in the towel with my ‘spring’ meal planning. It just wasn’t cutting it. It was time for some warm, gooey, comfort food baking away in the oven. 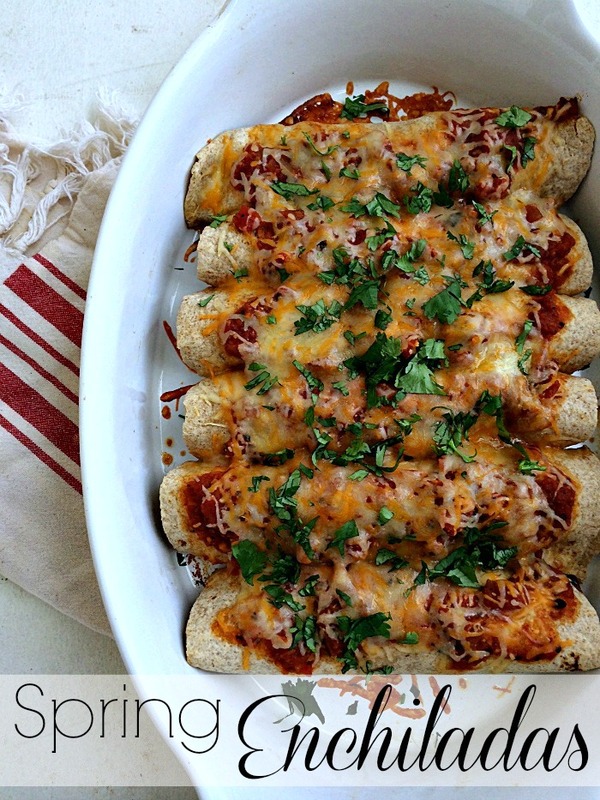 And that is precisely what these spring enchiladas are about. Black beans, corn, avocado, all rolled up in whole wheat tortillas, topped with shredded cheddar, salsa, and cilantro. Oh so comforting but still keeping it easy on the waistline because, you know, pool season is around the corner. If you can even believe that. Right now, I so have my doubts. Preheat the oven to 350°F. Coat an 9x13 baking dish with cooking spray. Combine chipotle and sour cream in a bowl. Purée half the beans in a food processor; add to the sour cream mixture. Stir in the whole beans and corn until well combined and then gently stir in the avocado. Season with salt & pepper. Warm the tortillas according to package directions. Working one at a time, spoon one-eigth of the bean mixture down the center of each. Roll the tortillas closed and place seam-side down in the prepared baking dish. Spoon the salsa over the tortillas and top with the shredded cheese. Cover and bake 20 minutes until cheese is melted and burritos are warmed through and browned on top. So, we share a gate with some neighbors. And by share a gate, I mean it’s never shut. They have two littles who I’ve mentioned on here from time to time, Ryder (8) and Meadow (6). Brother and sister share the same birthday (I don’t understand how that could ever happen), which is weeks apart from L’s. Needless to say, L and Ryder and often Meadow and B are inseparable. Like approaching 8:00PM in the dead of winter on a school night hey maybe you should go home? ‘Nah, it’s ok’ inseparable. Of course, like any friends, they have their moments. Melt downs have occurred and one or both have gone stomping home only to have asked 5 minutes later, ‘hey, can I go play with R?’ I will never understand boys. Um, sure? And off into the woods they go. All 4’10”, 79 pounds of them. Because best friends share the exact same stats, apparently. I have to say. Months before while we were contemplating our addition, we did do a bit of research about just moving. It would be easier. We could get the space we wanted. We didn’t have to live through construction. We could get everything we wanted. The first thing that hit me, and actually brought tears to my eyes, was taking L away from Ryder. I couldn’t do it. His little heart would break worse than any girl ever could cause. At least, I hope. I could be being naive about that one. I probably am. But there is something to be said about living seconds away from your best friend. I grew up that way. I ran out the door. I maybe came home for dinner. And that was that. What we have going on here is priceless, better than anything on the market. M coaches Ryder in baseball. Vice versa for L with football. Julie can throw a football. I can pitch a baseball (kind of. Ok hey, I’m trying). Meadow gives me a bit of girl world in the sea of boys, and they scoop up L for an overnight at their lake house and I have an endless supply of Trader Joe fruit leathers which are always in demand by the crew. Bo Jangles, their cat, even knows to come this way if their home is shut down. Many of our weekends begin with ‘ok, what is your schedule like?’ I’ll take Ryder to football registration, you cover basketball pictures, and so on and so forth. When I was growing up, the phrase ‘it takes a village‘ was made popular by Hillary Clinton. And while I don’t exactly agree with that, I do agree that it takes our little combination of Shady + Drury Lane. And I’m forever grateful that our kids have what they have, meaning I’m never ever moving grateful. Want to make a pact, Caranis? I’ll make you these burgers for life. 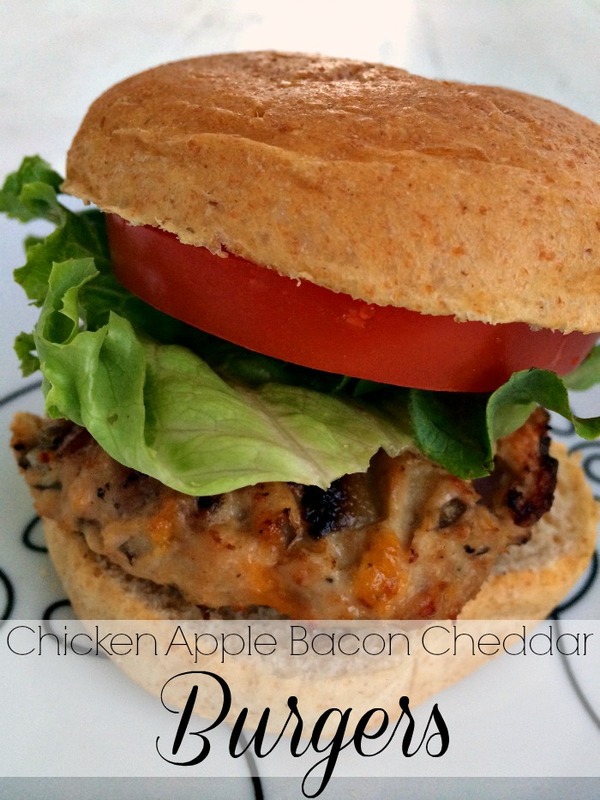 These chicken mixed up with black forest bacon, sharp cheddar, granny smith apples, red onion, and a dollop of dijon burgers. Delicious doesn’t even begin to describe them and I so love how even Ryder and Meadow gobble them up. If you ever want more, you know where to find them. Just across the always open gate. (Please note these amounts are very flexible. I kind of threw things together in a bowl. Add more or less, depending on your preference). Mix all ingredients together with your hands and form into 6 burgers. Grill over medium heat for 5-8 minutes per side, until cooked through. We served on whole wheat buns with lettuce and tomato. Enjoy, and share any extras with a friend.